I have a neighbor down the street with one of those homemade “Drill!” signs out front of his house. Naturally he also has a McCain sign right next to it. My neighbor is one of those people who thinks the best way out of our present situation of “high” gasoline prices is to sink a drillbit under every square hectare of the US, its territories, and its continental shelf. By the way, I say “high” with quotes because US citizens pay one of the lowest prices per gallon in the world. Our gasoline is dirt cheap, even now. Except we can’t. For one thing, if we could, why haven’t we already? If it were possible to open up enough land and water for drilling in the US to offset our need for foreign oil, why haven’t we plowed ahead with that plan? I doubt hippies could get in the way if the US were actually sitting on that many billions of untapped dollars. Hippies didn’t stop us before. At one time the US was the world’s supplier of oil. We won WWII and strode forward into the 1950s on titan legs powered by Texas crude, then Californian, then Gulf of Mexico-an. We were rolling in oil, until we weren’t. By 1970 it was clear that the party was over, and oil reserves were running down. We’d tapped the primo goods, we had only half our cache left, we were smoking it up a lot faster than we used to, and we began to notice the baggie was running low. So we found some dealers. Namely the Saudis, the Iraqis, the Iranians, the Venezuelans, the Russians, the Canadians, the Mexicans, and basically anyone else on the face of the Earth who was holding. That US Department of Energy graph you just skimmed over shows the size of US proven oil reserves from 1900 to today, in millions of barrels. Notice how it keeps going up like that, until the late 1960s? That is when we started running low, and it wasn’t because of flower children. It was because the geologic supply of crude oil in the sediments down in the Earth beneath our free and brave American feet had been mostly sucked up to win WWII and build a Leave it to Beaver 1950s for my parents. After 1970 the amount of oil coming out of American wells started declining because there is only so much black goo down there. It’s not infinite, folks, or we’d have some really interesting physics on our hands. In the early 1970s the Alaskan reserves were brought to market. That’s the spike in that graph up there. Notice what happened afterward? Alaska didn’t put the dotty trend back on an upwards climb, it only gave us a one-time boost that quickly bled back down. Since the 1970s the oil industry has adopted literally the finest exploration and extraction technologies that money can buy on Earth, including the world’s best satellite remote-sensing techniques, the world’s best seismic exploration and analysis technologies, and the finest cutting-edge computers and geology experts, all dedicated to rooting out every drop. Yet the trend keeps going down. You might notice how that trend is going down too. How much more oil could we get if we opened up every scrap of US land and drilled to the GOP’s heartless content? If we’re lucky, and we try very very hard, and no oil patch is left untapped, the US could take that last red blip on the Alaska graph and nudge it up to maybe where it was in 1995. After which time it will bleed back down and merge back with the rest of the trend in that first graph. The rest of the world owns a whole lot more crude oil under its sands and jungles than we do under our purple mountains and amber waves. Specifically, the US has about 24 billion barrels of oil still underground. The rest of the world has about 1,214 billion barrels (EIA). In percentage terms, that’s 1.9% US, 98.1% everybody else. 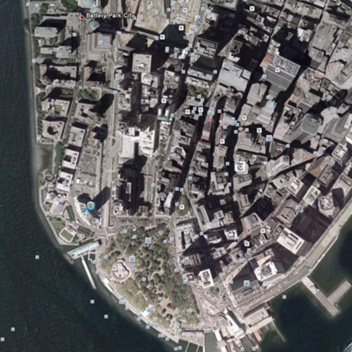 Put into another perspective, this Google Earth image of Lower Manhattan is 352 x 352 pixels. If every 10×10 pixels is a billion barrels of oil, the size of this picture stands for the size of the world’s oil reserves. And this version stands for the size of US oil reserves, at exactly the same number of pixels/barrel. We cannot drill out way to oil independence. We cannot drill our way into making those first two graphs ever go back up. If we want to keep using all the oil we want, we need to keep buying it from whomever is selling. Our problem today is that the dealers are also running low. Every oil-producing nation on Earth has its taps wide open, and there is no backup supply. There are expensive oil shales, tar sands, and heavy oils, which we can scrape up if we become sufficiently desperate, but those are poor substitutes at best, and filthy even compared with oil. Essentially we’re down to stems and seeds and we don’t have a grow room. Our options are severely limited, unless we quit. Which we can’t do. At least not yet. We don’t just get gasoline from oil, we get raw materials that make up a sizable portion of nearly everything you see when you pan your head around your computer room. Including the computer. Energy is only part of the problem, and not necessarily the biggest part. We can get sustainable amounts of energy from a practical mixture of solar photovoltaics, wind turbines, efficiency, innovation, improving existing hydroelectric dams, some limited new nuclear fission, and “clean” coal (as much as there is such a thing). We can probably also get a reliable supply of natural gas and alcohol fuels from agriculture and aquaculture, but only so much. But so far we don’t have an alternative resource base for all the inexpensive raw materials we currently get from oil. We need a plan B, and we need it yesterday. The facts of life are that oil is running down, not up, from now on. The grownup response to this might be to start thinking about how to cut back, invent, invest, and adapt. The kindergarten response would be to deny there is a problem, insist that yes there IS plenty of oil, stomp your feet, and call anyone who disagrees with you a poopyhead. I think most people would prefer the grownup response. The GOP is offering the toddler’s perspective. Perhaps it’s time to put them down for a long nap. ~ by Planetologist on September 18, 2008. According to this article in Biodiesel Magazine, industrial hemp could be very competitive with other crop sources currently used for biodiesel production, such as canola. It looks like most of the barriers to using hemp to produce biodiesel relate to economies of scale, with hemp production just not being very large right now. 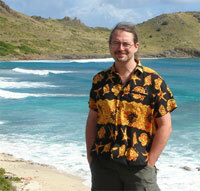 If production were mainstreamed, those scale issues would likely become less important. Biodiesel from hemp uses oil from seeds, and from the figures quoted in that article the seed/acre productivity of hemp is not quite as good as canola, and a strong market for food quality hemp oil currently makes using it for biodiesel production uncompetitive. But again, that is likely a surmountable scale issue. I don’t know if hemp, switchgrass, canola or some other crop would be ‘best’ for biodiesel, ultimately. But I agree that the sophomoric prohibitionists in the White House, Congress and DEA are not helping matters. What would be the impact on bio-fuels if Hemp were to be legalized? I’m not so much talking about Canabis Sativa or Indica (though I wish they would be legalized and taxed for the $50 BILLION that we are letting the drug cartels collect). But Hemp. Good ole fashioned fiberous HEMP. I’ve been keeping up with this blog ever since Bad Astronomy pointed me this way, and have thoroughly enjoyed your writing style and choice of topics. Please continue the excellent work! The US is well behind most industrial nations in this regard. That it can be done differently is demonstrated by many European countries. For example, Switzerland draws nearly 60% of its power from hydroelectric power plants, while the rest comes from nuclear power. No fossil fuels used to generate electricity. What’s most pathetic is that people have been shrieking about this since the ’70s but the public is only too glad to believe that the oil shortages will only be temporary, nothing to worry about. I remember reading a National Geographic article in the early ’80s about how they were going to have to increase the CAFE standards to something like 40mpg, and soon. What a sad, SICK joke.